Please please please read these TOU carefully. By using any of our Services, You agree to comply with these TOU. If You do not agree to the terms and conditions contained in the TOU, You agree not to use the Services, and We do not consent to provide You with access to the Services. In addition, when using any of our Services, You and crowdability, Inc., its business units, subsidiaries and affiliates ("crowdability," "We," "Our," or "Us") shall be subject to any posted guidelines or rules applicable to such Services, which may be posted and modified from time to time. All such guidelines or rules are hereby incorporated by reference into the TOU. You also understand and agree that the Services may include certain communications from crowdability, such as service announcements and administrative messages that You may not be able to opt out of receiving. We may periodically change the Terms without notice, and You are responsible for checking these Terms periodically for revisions. All amended Terms become effective upon Our posting to the Site, and any use of the Site after such revisions have been posted signifies Your consent to the changes. We use a diverse range of information, text, photographs, designs, graphics, images and other materials on the crowdability site. We provide the information and content (which we collectively call the "Materials") on the crowdability site FOR YOUR PERSONAL, NON-COMMERCIAL USE ONLY. Accordingly, You may view, use, copy, and distribute the Materials found on the crowdability site for internal, noncommercial, informational purposes only. You are prohibited from data mining, scraping, crawling, or using any process or processes that send automated queries to the crowdability site. You may not use the crowdablitiy site to compile a collection of listings, including a competing listing product or service. You may not use the Site or any Materials for any unsolicited commercial e-mail. Except as authorized in this paragraph, You are not being granted a license under any copyright, trademark, patent or other intellectual property right in the Materials or the products, services, processes or technology described therein. All such rights are retained by crowdability, its subsidiaries, parent companies, and/or any third party owner of such rights. The crowdability company name and logos and all related products and service names, design marks and slogans are trademarks and service marks owned by and used under license from crowdability, Inc., or its wholly-owned subsidiaries. All other trademarks and service marks herein are the property of their respective owners. All copies that you make of the Materials or this site must bear any copyright, trademark or other proprietary notice located on the site that pertains to the material being copied. You are not authorized to use any crowdability name or mark in any advertising, publicity or in any other commercial manner without the prior written consent of crowdability. Requests for authorization should be made to terms@crowdability.com. The companies mentioned on the crowdability site may be interested in private investments. Investor members on the third party crowdfunding sites from which We aggregate opportunities can view more details about these investment opportunities. Pending further SEC guidelines, only accredited investors can signup to see these details on the third party sites at this time. We do not investigate, represent or endorse the accuracy, legality, legitimacy, validity, or quality of any products, services, companies, investment opportunities, or Materials (collectively, the “opportunity” or "opportunities”), including those contained on, distributed through, or linked, downloaded or accessed from the crowdability site. References that We make to any names, marks, products, services, companies, deals, or opportunities of third parties or hypertext links to third party sites or information do not constitute or imply our endorsement, sponsorship or recommendation of the third party, of the quality of any product or service, opportunity, information or other materials displayed, invested in, or obtained by You as a result of any material or any other information in or in connection with the crowdability site. Crowdability communicates information provided and created by various third party crowdfunding sites, companies, software developers, publishers, employees, users, and other third parties. We have no control over the accuracy of such information on Our pages, and Material on the crowdability site may include technical inaccuracies or typographical errors. All of the data on opportunities including but not limited to, the deal terms and the availability of access to any deal thereof, is subject to change without notice by the party providing the opportunities. You should use discretion while browsing the Internet. Crowdability reserves the right, in its sole discretion and without any obligation, to make improvements to, or correct any error or omissions in, any portion of the Site. Where appropriate, we will endeavor to update information listed on the Site on a timely basis, but shall not be liable for any inaccuracies. Links to external Internet sites are provided within the content on the Site as a convenience to users. The listing of an external site does not imply endorsement of the site by crowdability or its affiliates. Crowdability does not make any representations regarding the availability and performance of its Web site or any of the Web sites to which we provide links. When you click on external links from the Site, your browser automatically may direct you to a new browser window that is not hosted or controlled by Crowdability. Crowdability and its affiliates are not responsible for the content, functionality, or technological safety of these external sites. We reserve the right to disable links to or from third-party sites to our Site, although we are under no obligation to do so. This right to disable links includes links to or from content partners that may use our Marks as part of a co-branding relationship. Some external links may produce information that some people find objectionable, inappropriate, or offensive. We are not responsible for the accuracy, relevancy, copyright compliance, legality, or decency of material contained in any externally linked Web sites. We do not fully screen or investigate third party crowdfunding sites before or after including them in directory listings that become part of the Materials on our Site, and we make no representation and assume no responsibility concerning the content that third parties submit to become listed in any of these directories. Crowdability is a publisher. Nothing on this Site should be construed as an offer to sell, a solicitation of an offer to buy, or a recommendation for any security by any third party. You understand that no content published as part of the Services constitutes a recommendation that any particular investment, security, portfolio of securities, transaction or investment strategy is suitable for any specific person. You further understand that none of the creators or providers of our Services or their affiliates will advise You personally concerning the nature, potential, value or suitability of any particular investment, security, portfolio of securities, transaction, investment strategy or other matter. Accordingly, do not attempt to contact us seeking personalized investment advice, which we cannot provide. Neither we nor any third party crowdfunding site is making a recommendation regarding any particular company or opportunity. To the extent any Material published as part of the Services may be deemed to be investment advice, such information is impersonal and not tailored to the investment needs of any specific person. You are solely responsible for determining whether any investment, investment strategy, security or related transaction is appropriate for you based on your personal on your personal investment objectives, financial circumstances and risk tolerance. Investors and users should should consult with licensed legal professionals and investment advisors for any legal, tax, insurance or investment advice. 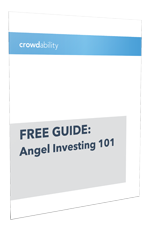 Crowdability is not a “broker,” “dealer” or “funding portal” (as defined in Section 3(A) of the Securities Exchange Act of 1934, as amended.) Crowdability does not produce in-house research, provide investment advisory services, or conduct a general retail business. Crowdability does not endorse any third party crowdfunding site, or third party content or opportunities, including, without limitation, any startup seeking to raise capital through the third party crowdfunding site or using its services. Crowdability merely serves as an aggregator and publisher for opportunities published on third party crowdfunding sites. Crowdability is not involved in the actual transaction between any investor and the startups found on a third party crowdfunding site, and Crowability is not responsible for any investment or other decisions made by any individual or entity in connection with any opportunity posted on such third party crowdfunding sites. The Services, and any content obtained or accessed through the Services, including without limitation third party content, is provided "as is" without representations or warranties of any kind, either express or implied. To the fullest extent permissible pursuant to applicable law, crowdability, its officers, directors, employees, subsidiaries, affiliates, suppliers, advertisers, and agents disclaim all warranties, express, implied or statutory, including, but not limited to, implied warranties of title, non-infringement, merchantability, and fitness for a particular purpose or use, and all warranties relating to the adequacy, accuracy, timeliness or completeness of any information available through the Services. Crowdability and its affiliates, suppliers, agents and sponsors do not warrant and accept no liability that Your use of the Services and any content contained therein, including without limitation, third party content, will be uninterrupted, error-free, or secure, that defects will be corrected, or that the Services or the server(s) on which the Services are hosted are free of viruses, worms, malicious code, Trojan horses, malware, or other harmful components. Crowdability and its affiliates, suppliers, agents and sponsors accept no liability for any software downloaded from the Services. You acknowledge that You are responsible for obtaining and maintaining all telephone, computer hardware and other equipment needed to access and use the Services, and all charges related thereto. You assume total responsibility and risk for Your use of the Services and Your reliance thereon. No opinion, advice, or statement of crowdability or its affiliates, suppliers, agents, members, or visitors, whether made on the site or otherwise, shall create any warranty. Your use of the Site, the content contained therein, and Materials provided through the site, are entirely at Your own risk. Crowdability and its affiliates, agents and sponsors will not be liable for any informational errors, incompleteness, delays or any actions taken in reliance on information contained in the Services. All information regarding opportunities on third party crowdfunding sites is only intended for and accessible to accredited investors. Accredited investors need to sign in on these third party sites using their own, unique username and password. Without signing in, users and other visitors will only be able to see limited information regarding the third party crowdfunding platform and investment opportunities that are already closed. The username and password intend specifically to prevent the general public from receiving information about active capital raises. All information about the opportunities is provided to us by the third party crowdfunding site owner, or unilaterally added by crowdability using publicly available information, such as information directly from their website and/or third party websites. Being listed or mentioned on crowdability is not an endorsement by us, and We make no representation as to any third party crowdfunding site’s legality and trustworthiness. We may use the word "crowdfunding" not from a legal perspective, but in its broad and commonsense meaning of raising funds from a group of people. A possibility exists that content available through the Services could include inaccuracies or errors, or materials that violate the TOU. Additionally, a possibility exists that unauthorized alterations could be made to the content available through the Services by third parties. Although we attempt to ensure the integrity of our websites and Services, we make no guarantees as to the completeness or correctness of any content available through the Services. In the event that such a situation arises, please contact us at notices@crowdability.com with, if possible, a description of the material to be checked and the location (URL) where such material can be found on our websites, if applicable, as well as information sufficient to enable us to contact You. We will try to address Your concerns as soon as reasonably practicable. For copyright infringement claims, see the section on "Copyright Infringement" below. Under no circumstances shall crowdability be held liable for any delay or failure in performance resulting directly or indirectly from acts of nature, forces, or causes beyond its reasonable control, including, without limitation, Internet failures, computer equipment failures, telecommunication equipment failures, other equipment failures, electrical power failures, strikes, labor disputes, riots, insurrections, civil disturbances, shortages of labor or materials, fires, floods, storms, explosions, acts of God, war, governmental actions, orders of domestic or foreign courts or tribunals, or non-performance of third parties. CROWDABILITY DISCLAIMS ANY AND ALL WARRANTIES TO THE FULLEST EXTENT OF THE LAW, INCLUDING ANY WARRANTIES FOR ANY INFORMATION, MATERIALS, OR OPPORTUNITIES OBTAINED THROUGH, POSTED OR RECEIVED THROUGH ANY LINKS PROVIDED BY OR THROUGH THE SITE. YOUR SOLE REMEDY FOR DISSATISFACTION WITH THE SERVICES IS TO STOP USING IT. THE SOLE AND EXCLUSIVE MAXIMUM LIABILITY TO COMPANY FOR ALL DAMAGES, LOSSES, AND CAUSES OF ACTION — WHETHER IN CONTRACT, TORT (INCLUDING, WITHOUT LIMITATION, NEGLIGENCE), OR OTHERWISE — SHALL BE THE TOTAL AMOUNT PAID TO US BY YOU, IF ANY, FOR ACCESS TO THE SERVICES IN THE CURRENT CALENDAR YEAR OF YOUR SUBSCRIPTION. If You believe in good faith that materials displayed on crowdability infringes Your copyright, You (or Your agent) may contact: Copyright Agent, Legal Department, Crowdability, Inc., 205 Hudson Street, 7th Floor, New York, NY 10013; email: notices@crowdability.com, with the following information: (a) an electronic or physical signature of the person authorized to act on behalf of the owner of the copyright or trademark interest; (b) a description of the copyrighted work(s) or trademark(s) that You claim has been infringed; (c) a description of where the material that You claim is infringing is located on the website; (d) Your address, telephone number, and email address; (e) a written statement by You that You have a good faith belief that the disputed use is not authorized by the copyright or trademark owner, its agent, or the law; and (f) a statement by You, made under penalty of perjury, that the above information in Your notice is accurate and that You are the copyright or trademark owner or authorized to act on the copyright or trademark owner's behalf. Please note that You will be liable for damages (including costs and attorneys' fees) if You materially misrepresent that any material on our sites is infringing Your copyrights. California residents may contact the Complaint Assistance Unit of the Division of Consumer Services of the California Department of Consumer Affairs in writing at 400 R Street, Suite 1080, Sacramento, CA 95814, or by telephone at (916) 445-1254 or (800) 952-5210. Our primary goal in collecting personal information is to provide you with a friendly and customized experience. We collect only the personal information that is relevant to the purpose of our site and service. We do not process this information in a way that is incompatible with the purpose for which it has been collected or subsequently authorized by you. Questions or comments regarding this policy should be directed to feedback@crowdability.com. Personal information is provided by users when signing up or registering on Crowdability, our free site, when registering as a subscriber to one of our free or premium subscription services, and voluntarily at certain other points, such as entering contests, completing surveys or through any marketing paths. In order to register, you will have to supply us with your email address. In the future, if you would like access to one or more of our premium subscription-based services, you will need to supply us with the information specified to activate your free trial or paid subscription. This may include credit card or other payment account information which we maintain in encrypted form on our servers. White Papers. We may offer white papers and bonus reports on various investment and financial topics. In order to download these special reports, you may be required to enter your email address, phone number and/or some additional personal information. Blogs. We may offer blogs featuring running commentary by popular investors. These blogs allow subscribers to respond to a blogger's commentary or to another subscriber's post. Access to some blogs may require a paid subscription to one of our premium services. We urge and encourage participants posting comments on the blogs to include their full name in any comment and to disclose any investments held in private company securities they discuss in any comment. Please note that information submitted to the blogs will be available for any user of that service to read, and is no longer private. Surveys/Polls. At certain times, you may be asked to participate in surveys, which are generally aimed at obtaining general information, for example, your investment experience or your reaction to a particular article or blog post. Because information obtained in these surveys is connected with individual subscribers and is used internally, participation is voluntary. In addition, some columnists will on occasion take polls of their readers. Such polls are solely for the editorial use of the individual columnists, and participation is voluntary. Tracking information is automatically collected about all visitors to Crowdability. This information consists of both individual and aggregated tracking information and is automatically gathered using "cookies." A cookie is a small data file containing information, such as a user's login name, that is written to the user's hard drive by a web server and used to track the pages visited. In addition to the cookies described above, crowdability, its agents, advertisers and third-party advertising vendors that serve ads onto our websites, and other third party partners may use their own or third-party cookies or other tracking technologies for advertising, including delivering targeted advertisements and marketing messages based upon the websites you visit, or other purposes. We are not and cannot be responsible for the privacy policies or practices of third party advertisers and vendors. The Services may offer social sharing features and other integrated tools (for example, the Facebook “Like” button), which enables you to share actions you take on our Services with other media, and vice versa. Your use of such features enables the sharing of information with your friends or the public, depending on the settings you establish with the entity that provides the social sharing feature. For more information about the purpose and scope of data collection and processing in connection with social sharing features, please visit the privacy policies of the entities that provide these features. We may make chat rooms, forums, message boards, and/or news groups available to you through our Site in the future. Please remember that any information disclosed in these areas becomes public information. If you post personal information online that is accessible to the public, you may receive unsolicited responses. You should exercise caution when deciding to disclose any of your personal information in a public forum. Crowdability limits access to personal information about you to those employees whom we determine need access to that information to provide products or services to you. We maintain physical, electronic and procedural safeguards that comply with federal standards to guard your personal information. However, no security system is impenetrable. We cannot guarantee the security of our servers, nor can we guarantee that information that users supply will not be intercepted while being transmitted to us over the Internet. Questions or comments regarding this policy should be directed to feedback@crowdability.com. Crowdability reserves the right to modify this policy. You may review, correct or modify information maintained in your online account at any time by logging into your account and updating your profile information or by emailing us at support@crowdability.com. If you wish to delete or deactivate your account, please email us at support@crowdability.com, but note that some information you provide through the Services may continue to be accessible (e.g., comments you submit through the Services) and that we may continue to store information about you as required by law or for legitimate business purposes. We may also retain cached or archived copies of information about you for a certain period of time. You may opt out of receiving promotional communications from us by following the instructions in those communications or by sending an email to support@crowdability.com. If you opt out, we may still send you non-promotional communications, such as those about your account or our ongoing business relations.